Kyanite is associated with Pisces, Aries, Taurus and Libra. The most well-known and common forms of Kyanite are blue. The word “kyanite” is in fact derived from a Greek word that means “blue”. There are only two stones which never need to be cleansed and Kyanite is one of them as it does not hold negative energy. Citrine is the other. Kyanite is said to be one of the best stones to be used as an attunement stone because its energy is unlimited and because it transmits and amplifies high-frequency energies. For this reason, it is also a great stone for meditation and dream work. Kyanite calms the body, quiets the mind and dissolves emotional, mental or spiritual confusion, thereby releasing anxiety. In addition, this stone also works well for dissolving anger and frustration or when you are experiencing difficulties with meditation. It is actually one of the best stones for meditation, especially if you are easily distracted and find your mind drifting to your current worries. It eases meditation and centers you in preparation. It enhances meditation because as a third-eye chakra stone it can pull very high vibrations through this chakra which are processed as messages from other realms (this also helps with dream recall). Intuitive and psychic thoughts and abilities can be obtained more easily because of Blue Kyanite’s ability to transfer a high vibration. The stone can also be used to promote lucid dreaming, astral travel, tolerance, channeling, spiritual awakening, clear visualization and loyalty. Kyanite has several uses for chakra balancing: It is said to align all chakras automatically and immediately – without conscious direction. Because of this, Blue Kyanite is an excellent stone for any type of energy work. Similarly, it can be used to align the astral, ethereal, emotional, intellectual and spiritual “bodies” (layers of the energy field), including the layers of the aura (human energy field). By so doing, a larger and stronger aura is created, which contributes to the better overall health of the physical body. With the conscious intent of the user, it may also be used to open chakras. 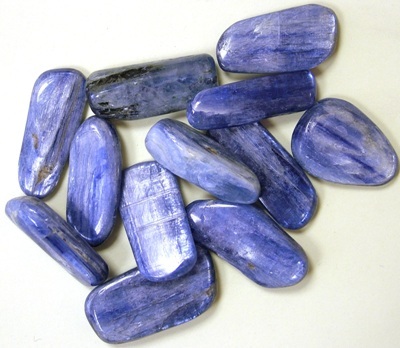 Blue Kyanite is especially good for working with the Throat Chakra and enhancing communication. It helps to speak one’s truth and it is a good stone for public speakers and performers. In group settings, Blue Kyanite can help bridge any gaps in communication and reduce the number of arguments, making it a good crystal to keep in the office or home. Blue Kyanite is useful for healing throat and voice ailments, healing in the areas of the muscular system, the brain and the sensory organs. In addition, it helps the glandular function and it is a good stone for epilepsy. As a calming stone, Kyanite restores Qi (or Ki) to the physical body, and balances yin/yang energies. Finally, Kyanite forms a bridge between mind and matter and as such it is a powerful stone which may help you reach your hopes, dreams and desires.